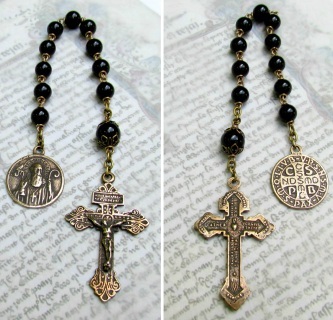 Handmade Catholic One Decade Rosaries, Chaplets and Tenners are made for heirloom quality and will last for years when treated with care. 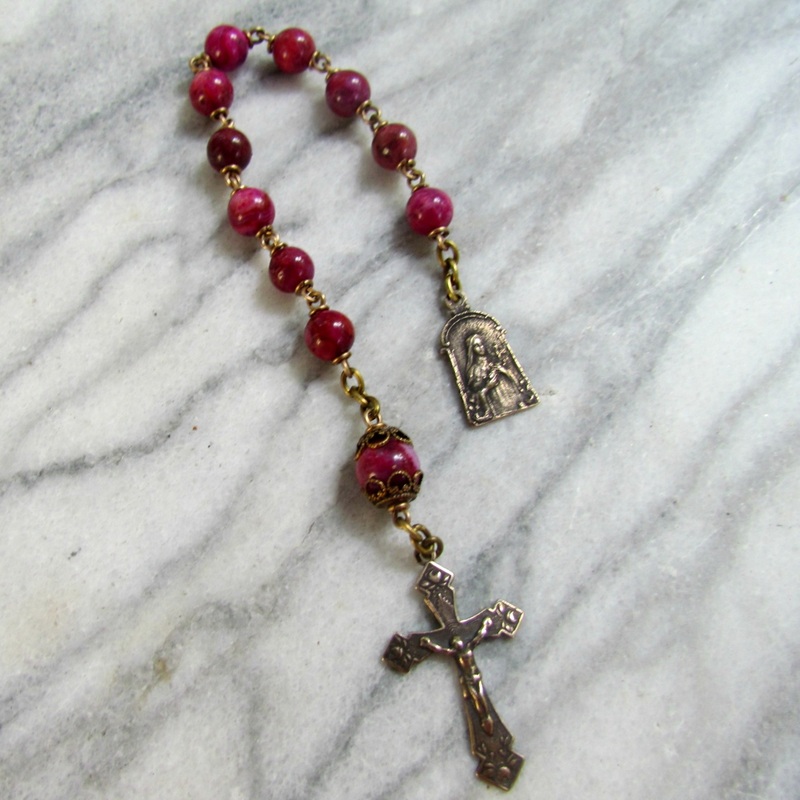 The hand turned solid wire chaplets are made for those who are very hard on their rosaries and chaplets. If you have a special request, please do not hesitate to contact me, as I can make a tenner very quickly according to your needs. International Customers: Please must contact me prior to purchase to calculate appropriate shipping fees and best shipping options. 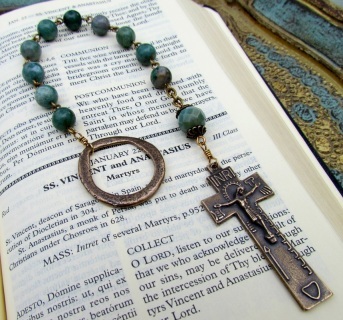 This high qualityhandmade St Joseph pocket rosary is a perfect gift for Father's Day. This one decade rosary, also called a 'tenner' is made with beautiful 8mm Leopardskin Jasper Gemstones and a 10mm Brecciated Jasper Gemstone for the Our Father bead. The beads are larger than the average rosary and easy to feel. 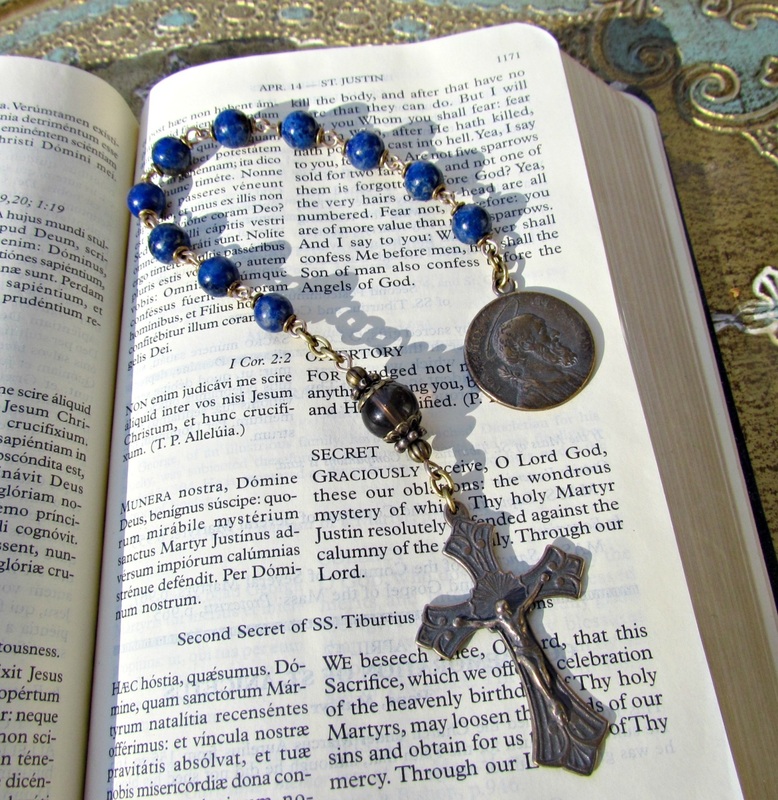 This makes a great pocket rosary. The crucifix and medal on this Chaplet were hand cast in solid bronze from antique pieces. They are beautifully detailed on both sides. This tenner is made with thick 20 gauge antiqued brass wire. Each bead is hand turned. The chain is solid brass, 17 gauge links. 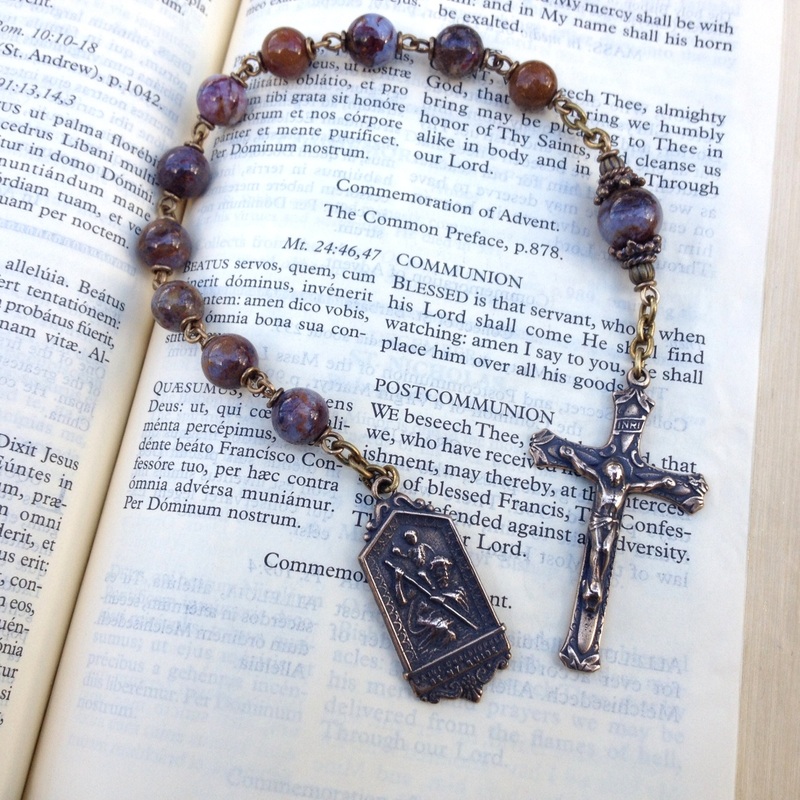 This pocket rosary is masculine and made to last! This handsome decade is made of 8mm Pietersite gemstones hand turned in solid 20 gauge brass wire. The pieces are handcast in solid bronze. A St. Christopher medal graces one end of the decade and the Crucifix graces the other. 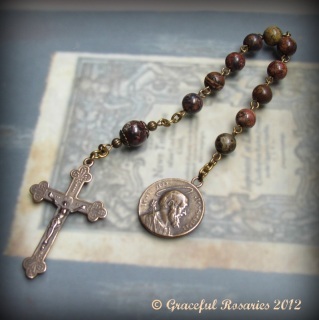 The Crucifix and St Joseph medal are hand cast in the USA in solid bronze using antique pieces. Each bead is individually wire wrapped with 22 gauge antiqued brass wire. 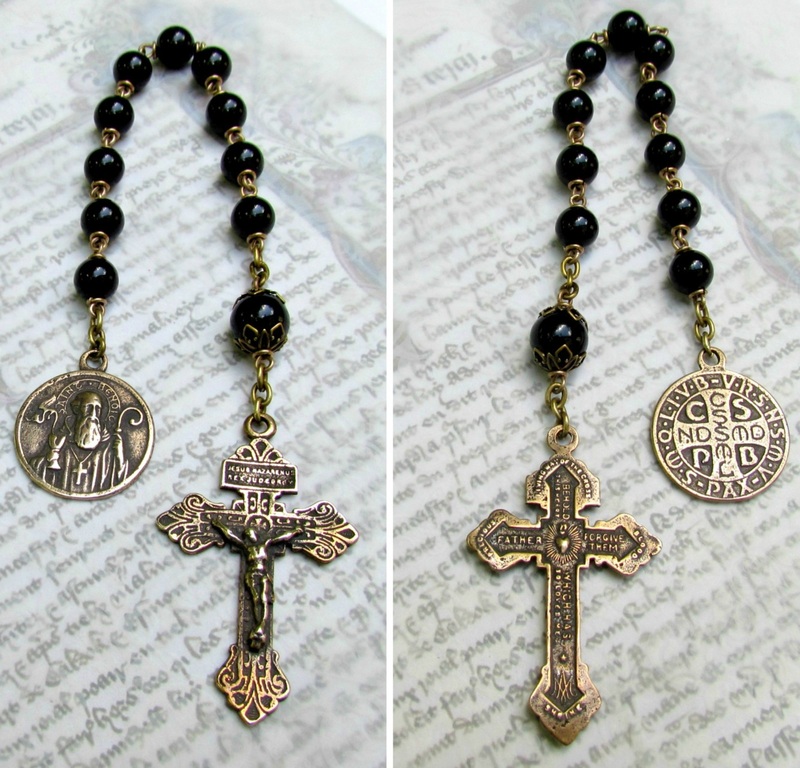 The result is a beautifully hand made, antique looking piece that is both practical for an everyday pocket rosary and made to treasure for years to come. A special and unique gift especially for Fathers! 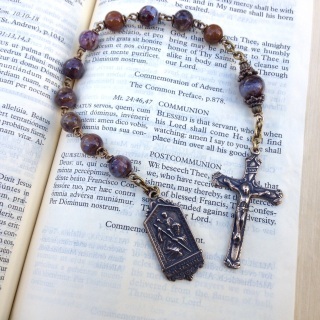 This lovely Pocket rosary is perfect for Policemen, Military guys or anyone with a devotion to St Michael. The Black onyx beads are hand turned with 20 gauge wire for a super strong and lasting rosary. Hail Mary beads: 8mm African TurquoiseOur Father beads: 10mm Faceted Fancy JasperCrucifix: Solid BronzeCeltic Ring: Solid bronzeWire: 20 gauge solid brass, hand wiredThe Irish Penal Rosary is a reproduction of the rosaries used during the penal time in Ireland when rosaries were forbidden. The ring slips over your finger to easily hold the rosary in your pocket for praying a decade of the rosary. Made to order. Allow 3-5 days for shipping. The solid bronze antique reproduction medal has St. Michael slaying the devil on the front side. 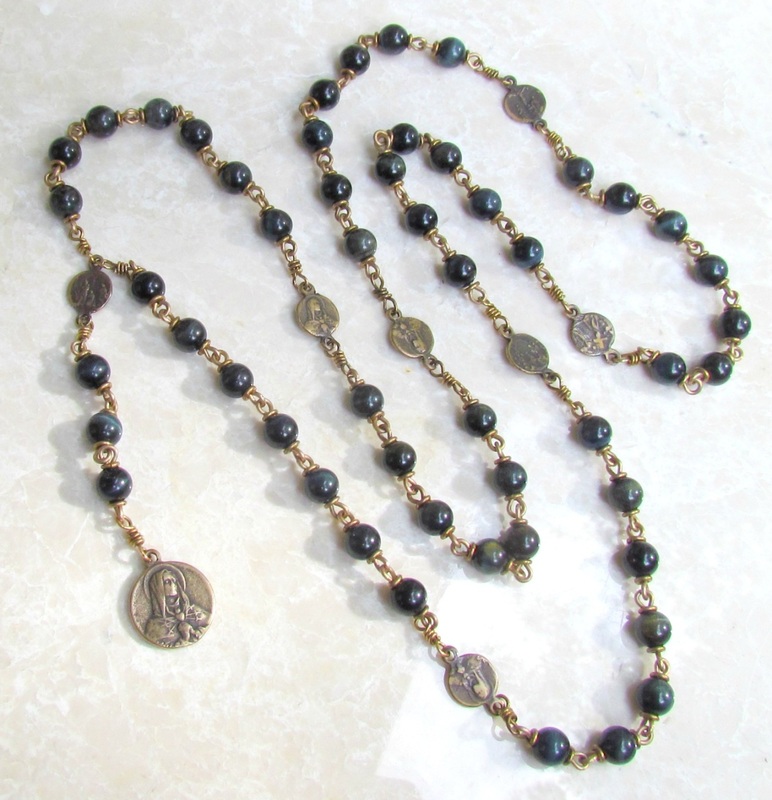 On the back is the inscription "I am a Catholic, in case of emergency notify a priest"
Each bead is hand turned with 20 gauge solid brass wire. This rosary is made to withstand years of use. It is well suited for a mans pocket rosary. Made to order. Allow 3-5 days for completion. The One decade rosary honors the Archangel St Raphael, patron saint of healing. Made with the same quality construction as my heirloom rosaries, this sacramental is a great gift for someone who is sick. Allow two week for shipping. This one decade Tenner is in honor of St Therese of the Little Flower of Jesus. The Rose Crucifix is a perfect compliment to the St Therese medal. The medals and wire are solid bronze. Available by special order. Allow two week for shipping. 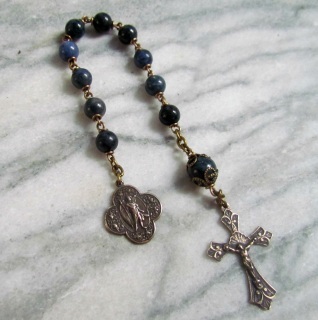 This Chaplet is made with 6mm Blue Tigereye gemstones. Each bead is linked with 20 gauge hand turned bronze wire. The connections of each medal are wire wrapped with 22 guage bronze wire. Their are seven connecting medals each of which depict one of the seven sorrows on one side. On the reverse side is an image of the sorrowful mother. These medals make this a really special chaplet. SOLD. 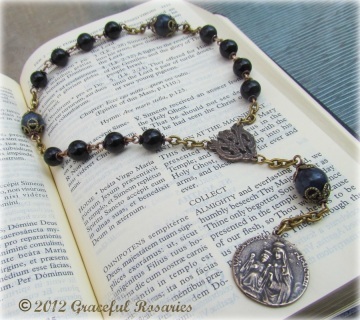 This Chaplet is available for custom order. Please allow 1-2 weeks for construction. 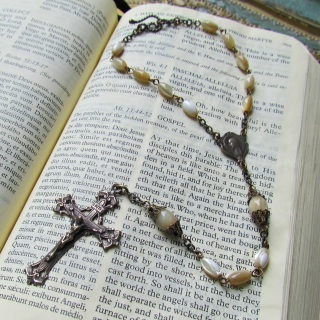 Mother of Pearl Car Rosary with Bronze. 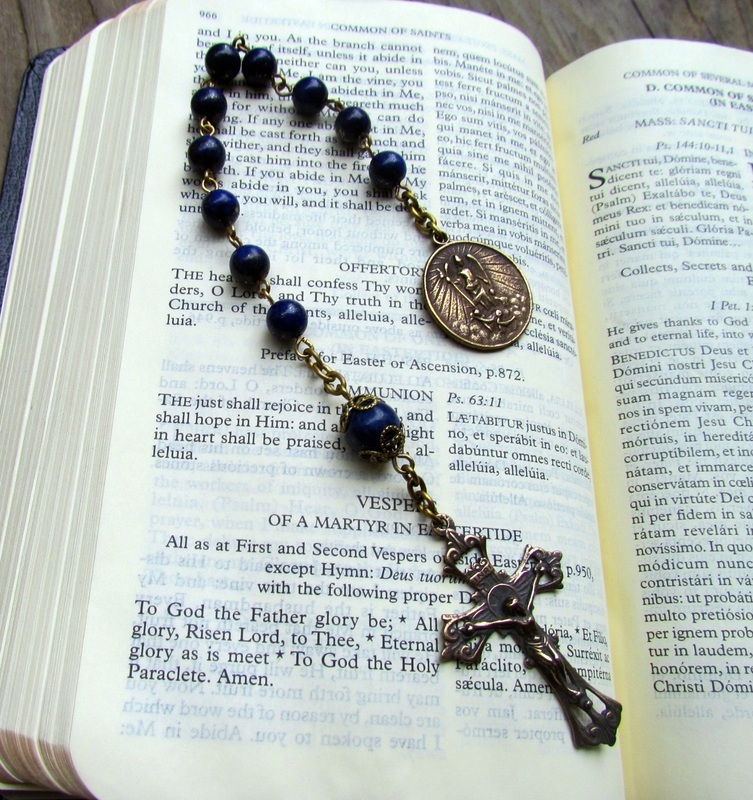 This rosary chaplet was made to easily attach over a car mirror with the hook and eye. The Mother of pearl beads and antique reproduction parts give this piece a very vintage anitque look. 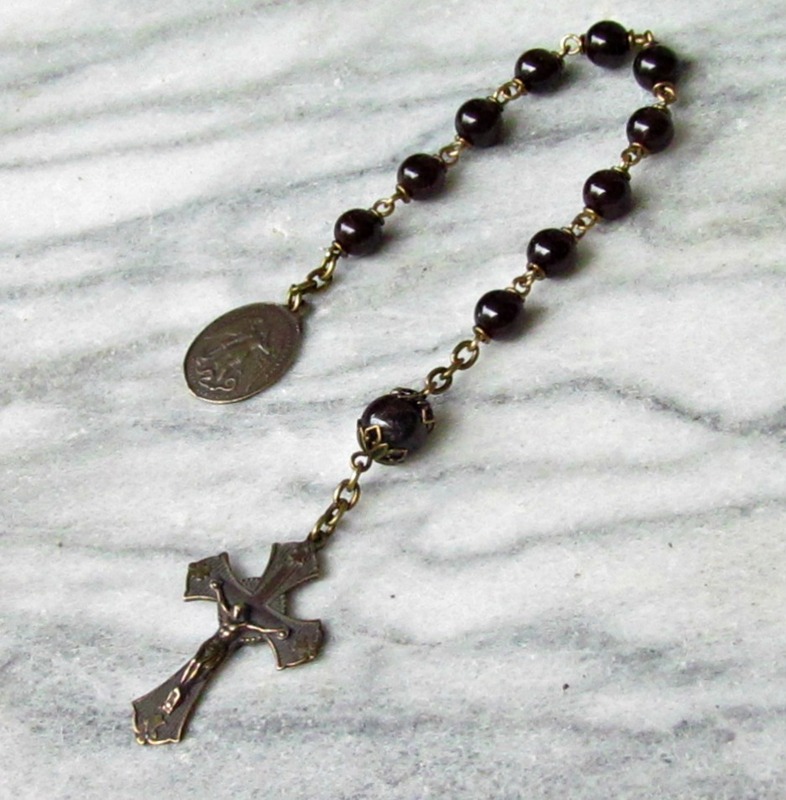 This rosary is made with 22 gauge wire. It is not as strong as the other wires that I use...but the shell beads did not have larger holes. Please keep in mind that this rosary will not be as tough as the other rosaries I make. But it will do great hanging in your car window!